6. A thigmotactic (opposition) reflex. Optimally, to best improve your dog’s walking behavior, we need to treat the preceding causal factors while concurrently addressing the walking behavior as a symptom. General excitability is defined as an abnormal state of emotional arousal that occurs commonly when novelty or change occurs in the environment. We can improve general excitability pertinent to leash walking naturally via a proactive stimulation program that includes longer or more frequent walks; rigorous exercise, such as running, bicycling, ball sprints, or swimming; mental stimulation applied by teaching or practicing obedience, trick, or agility training; and more frequent play with people or dogs. If long work hours are part of the problem, consider dog day care as part of an overall solution plan. Some researchers also believe that switching to a lower protein food can also reduce excitability or hyperactivity. Working with a professional CPT trainer on an overall impulse control training (ICT) program that teaches your dog that calm behavior better accomplishes his objectives will also prove beneficial. General under-stimulation is relevant when extreme arousal occurs not because of the inherent temperament of your dog, but primarily due to chronic boredom and lack of activity in your dog’s environment or daily schedule. Under-stimulation is best addressed by implementing a proactive stimulation program that includes more walks, exercise, mental challenges, and play. In addition, provide several stimulating toys to occupy your dog when he is alone and/or consider dog day care when your dog would otherwise spend a large portion of his day crated or isolated. It doesn’t look like she is having a lot of fun walking her dog. But, with proper training this excitable puller can convert to a loose-leash walker. Excitability or arousal related to a specific stimulus (e.g., dogs, cats, people, wildlife, cars, trucks) is best addressed by implementing a counterconditioning and desensitization program and cognitive behavior modification program that alters your dog’s behavior when he is exposed to the stimulus. A general impulse control training (ICT) program will also help. Our goal will be to relax your dog amidst the stimulus. If your dog wishes to have contact with the stimulus, we need to teach him that calm, composed behavior better accomplishes his goal. Consequently, we will remove him from the stimulus or expand distance when he acts excitably. Conversely, we will allow him proximity and eventual contact when he acts calmly. Over time, he will learn that excitable behavior is counterproductive, whereas less impulsive cognitive behavior, where he maintains equanimity, will allow him to achieve contact with the source of his attraction. On the other hand, if the relevant stimulus causes severe anxiety, fear, or aggression, whereby your dog acts excitably with a desire to repel the stimulus, the solution is different. 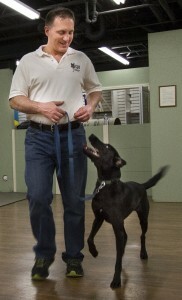 In such cases, a CPT Trainer/Behaviorist will design customized counterconditioning and desensitization drills that bolster your dog’s confidence amidst the stimulus, build his sense of trust and security amidst the stimulus, relax him amidst the stimulus, and teach him alternative coping strategies. Concurrently, we recommend impulse control training (ICT), leadership communication training, and proactive stimulation protocols, along with management strategies that avoid stimulus exposure sufficient to cause reactivity, at least until the behavior is modified. In addition, in severe cases, we may recommend the inclusion of homeopathic remedies or pharmaceutical medication that reduce generalized anxiety and impulsive behavior. Dominance issues may occur when your dog believes he is superior to you within the pack hierarchy or when your dog is very strong-willed and/or independent, whereby he may not believe he is a pack leader, but he resists control and commands from a pack leader when his interests and goals conflict with those of the pack leader. Consequently, if he is dominant, he is more likely to refuse commands and pull on leash, since dominant dogs often desire to be in the front when a pack travels collectively or when an intriguing stimulus appears in the environment. Yet, dominance is too often incorrectly and conveniently blamed as a cause of canine behavioral problems. If in addition to pulling, your dog: a) barks at you in protest post a command or reprimand, b) jumps on you uncontrollably (especially if he/she also remains on your body for a long period and attempts to push you backward), c) mouths or nips your hands or arms to solicit attention or control or to protest a command, d) passively and/or aloofly ignores your commands, reprimands, or solicitations, or e) growls at you over food, possessions, or territory or when refusing a command, then you may have an underlying dominance problem. Please note that the described behaviors may be more complicated and include anxiety, fear, excitability, confusion, frustration, or impulse control issues in combination with dominance or in lieu of dominance. Moreover, if your dog is a young puppy, jumping and mouthing and perhaps even protest barking are normal behaviors that likely do not indicate a noteworthy dominance issue. Consequently, you may wish to consult the services of a professional CPT trainer/behaviorist when confirming the diagnosis of a dominance problem and/or when designing the treatment program. We recommend a program combining impulse control training, leadership communication training, relationship building, positive reinforcement obedience training, and proactive stimulation when combatting dominance issues. In addition, until your dog’s behavior is modified, we recommend avoiding situations that are likely to provoke stubbornness, dominance protests, or aggressive displays. Lack of knowledge regarding walking protocol on the part of the owner or the dog is addressed by teaching proper mechanics and communication to the owner and insisting on consistent performance by the dog. You need to learn how to engage your dog in heel position, how to hold the leash, how and when to praise in a manner that motivates your dog, how and when to reward with food, and how and when to response block or punish undesirable behavior. 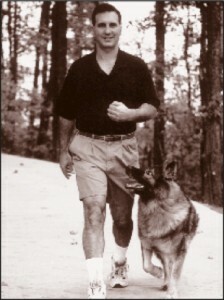 Similarly, your dog needs to learn that walking alongside you in heel position provides comfort, praise, and the possibility of a reward and that deviation from heel position provides the absence of comfort, praise, and reward, response blocking that prevents immediate continuation of the behavior, and the possibility of punishment that has stronger consequences and that may better prompt long-term behavior modification. A thigmotactic reflex is an autonomic reflex reaction in response to touch or physical pressure. In the case of walking a dog, when you hold a constantly tight leash your dog is likely to exhibit a thigmotactic opposition reflex that prompts pulling. In essence, your dog’s pulling is a Newtonian response- an equal and opposite physical reaction to the action of you holding a tight leash that misguidedly attempts to direct your dog proximal to your body. Therefore, poor leash management (a tight leash) may create a leash-pulling problem or exacerbate an existing pulling problem. 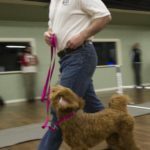 The cause is addressed by teaching proper walking protocol, communication, and leash management (using a loose-leash technique) and perhaps including specialized training equipment that facilitates successful leash walking behavior. Keep your arms relaxed and your leash loose. When teaching your dog to properly walk on a loose leash, insist that your dog remain in “heel position,” whereby he is on your left side with his right shoulder even with your left leg. Allow a grace distance of 6 inches to the front, 6 inches to the rear, and 12 inches to the left side- an imaginary area that we call “the comfort zone.” When your dog remains alongside you in heel position, keep your arms relaxed and your leash loose. Praise your dog for performing the correct behavior. To facilitate success, hold some food (treats, cut hot dogs, lunch meat) in your left hand to lure him to the correct position. Store extra food in your left pocket. When your dog achieves the desired position and provides focused attention by looking upward at your face, deliver extra praise and reward him with a small piece of the food. By keeping the leash loose, luring him with food to the correct position, praising him when he is correct, and rewarding him with food when he is both correct and attentive, we should train him to want to remain alongside you in the comfort zone. Nevertheless, some dogs are naturally compulsive pullers, easily distracted, or not motivated by food. In such cases, we may need to add response blocking or mild punishment to the training program. First, check that your leash is loose when he is in position. Ironically, as described above, a tight leash in an attempt to obtain or maintain control causes you to lose control by prompting reflexive thigmotactic pulling behavior. Ideally, “you should not walk your dog.” Instead, “your dog should walk with you.” Walking should be merely a lower extremity exercise where your arms just hang relaxed by your side. Thus, a tight leash prompts undesirable behavior from your dog and creates more work for you than is necessary; whereas, a loose leash reduces the probability of pulling and provides greater human comfort. If loosening the leash is insufficient, correct your dog with a sharp leash pop whenever he moves outside of heel position. Correct silently. Do not verbally admonish your dog. Restrict your verbal communication solely to delivering the initial “Walk” command and to praise. That way your voice is unequivocally positive and will better assist in relaxing your dog and teaching him that heel position is what you desire. Instead of verbally reprimanding, allow the leash/collar to deliver instructive punishment. If your dog is small or generally cooperative, a light correction rearward is all that is required. However, with stronger or more stubborn dogs, a harder two-handed correction may be necessary. After you correct/punish with a rearward leash pop, your dog should return to heel position. Once he returns to heel position, immediately loosen the leash and praise. Alternatively, if your dog is highly sensitive to leash punishment, whereby he responds anxiously, fearfully, or aggressively, we may prefer to use more of a response blocking technique. With response blocking, we simply stop and place light pressure on the leash sufficient to prevent your dog from moving forward. When he stops pulling, you will then again walk forward. By stopping forward movement, we are using a mild form of negative punishment, which is the subtraction of something otherwise rewarding- in this case, movement. When using this method, we hope that your dog desires forward movement, so that he will cease pulling to more expeditiously achieve his objective of proceeding on the walk. If the leash punishment and response blocking techniques are insufficient and your dog still compulsively pulls, then you may need to improve your equipment. Leather leashes are usually best. Leather leashes are stronger and kinder to your hands than nylon, rope, cloth, or chain leashes and provide more dexterity than retractable leashes. We recommend 6-foot leather leashes for small dogs and 3.5 to 4-foot leather leashes for large dogs. 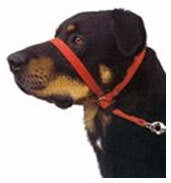 Pinch collars or Gentle Leader head halters are generally the most effective collar choices for modifying pulling behavior. 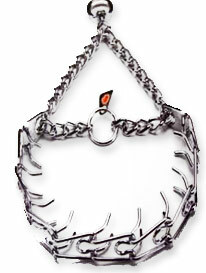 A third potential choice is a “no-pull” ventral harness. In comparison to the preferred choices, nylon collars and martingale collars are far less effective, dorsal attachment harnesses actually promote pulling, and chain collars (choke chains) are potentially injurious to refractory pullers. Usually, we only recommend so called “no-pull” harnesses that attach under the shoulder when a client dog is brachycephalic (flat-faced), such that he lacks sufficient muzzle length to properly fit a Gentle Leader, has tracheal issues that preclude humanely fitting the dog with a neck collar, or is a young puppy and where the dog is highly reactive, physically sensitive, or emotionally traumatized by the application of both the pinch collar and Gentle Leader that otherwise would be superior collar choices. In the vast majority of cases, the pinch collar and Gentle Leader are more effective than the no-pull harness and are willingly accepted by the owner and dog after a brief accommodation period. Despite its appearance, the pinch collar is very humane and often quickly effective, as it incorporates a natural simulated nipping correction that most dogs inherently understand and obey. The pinch collar works very well on friendly, robust, confident dogs with double coats. The Gentle Leader is generally a superior solution when the dog has a thin coat and/or low body fat around the neck (e.g., young Dobermans, Dalmatians, or Weimaraners), is aggressive, anxious, or excitable, or is hypersensitive to the pinch collar. Likewise, the pinch collar is often a superior solution for a dog that vehemently rebuts application of the Gentle Leader- some dogs frantically rebel against the sensation of the Gentle Leader muzzle loop. In addition, the pinch collar or no-pull-harness is preferred for brachycephalic dogs (e.g., Boston Terriers, Bulldogs, Pugs, Shih Tzus) that do not have sufficient muzzle length to properly fit a Gentle Leader. The fit of each collar is important. The collar should be snug, but not too tight. Since the collar is often an important tool in resolving leash walking problems, we recommend consulting with a professional CPT trainer regarding the proper selection and fitting of a training collar. Once you change your leash and collar, continue the training program as before. Lure with food to heel position while keeping the leash loose. Praise when he is in position. Reward him with food when he is both in the correct position and attentive toward your face. When he pulls, silently correct backward with the leash/collar, then immediately loosen the leash and praise when he returns to heel position. If you are still having problems, to improve the likelihood of success, try first teaching your pet in a quiet, low distraction environment, such as your basement, garage, or hallway. When he is proficient inside your home, progress to your driveway. Next, start practicing outdoors off your property at times and places that are not likely to contain neighborhood dogs or other environmental distractions. Finally, walk him amidst other dogs. If you are still having problems, then consult with an experienced CPT trainer/behaviorist who can effectively diagnose and treat the problem and who can provide productive feedback regarding your handling skills. If all goes according to plan, your dog will calmly and cooperatively walk on a loose leash. Subsequently, both you and your dog will receive more pleasure and bonding from your neighborhood walks. Moreover, when you begin to receive more enjoyment from your walks, you will probably walk your dog more, which increases your dog’s quality of life. Nevertheless, loose-leash walking is often a complex behavior that is difficult to resolve without the services of a professional trainer or behaviorist. Therefore, we recommend the inclusion of a CPT group class, private lesson, in-home private lesson, or board training program to raise the probability of success and/or to expedite results. To schedule a CPT training program, please contact the CPT office by phone at 404-236-2150 or contact us by e-mail via the Contact link at the top right of this web page. © Copyright Mark Spivak and Comprehensive Pet Therapy, Inc., May 2010, Revised February 2014. All rights reserved.